February 2008 was The Moment for David on American Idol. This was when the tectonic plates cracked open a bit, and a larger world took notice of The Voice. For those who loved David before, this took them to a new level of connection. For those for whom David wasn’t on the radar screen, this finally got their attention. David has been profoundly influenced by Eva Cassidy. He takes from her version of Imagine the expressiveness and melismatic flourishes that take this Beatles song to a different place. Do you remember when you first heard David sing Imagine? In the Beatles version, John Lennon’s voice is raspy, and he cultivates a cool sense of detachment. Most of us had heard this song innumerable times. We knew all the words, but they lay on the surface of our consciousness. When we listened to David’s intimate and emotionally charged version on February 26, 2008, we heard the words for the first time. As David sang the familiar words, we actually experienced Lennon’s idealistic vision. When did David first encounter this song? We may never know, but we do know that he performed it in public at the tender age of thirteen. This is a song that David knew for years before performing it on American Idol. Certainly his comfort with this song gave him some solid footing on the stress-filled AI stage. Imagine is a song that David has made his own, but he has seemingly chosen to sing it only infrequently. Each performance has been a lovely surprise. At the Ford Day event, it was the first time that we heard the song after the Idol competition ended. At the Los Angeles tree lighting ceremony it was a unexpected encore. On a personal note, davidfanLIZ still remembers the chills (and grabbing her concert buddy Rascal in delight) when David began to sing Imagine at the end of the Del Mar outdoor show. And on the return visit to American Idol in April, David stepped it up a notch when he confidently accompanied himself at the piano. What a difference from his first return trip to AI when he sang a more hesitant Touch My Hands and berated himself afterward. His growth and confidence as a performing artist were visible for all to see. The most recent performance of Imagine at Apple headquarters in the Bay Area offered yet another version, albeit only seen in video shot from a frustratingly long distance away. Imagine is a song that will forever be David’s. Here are all the performed versions gathered in one spot for your enjoyment. At the Wellington, Florida Boys & Girls Club on May 17th, 2004. David was thirteen years old. David’s voice is high – the voice of a 13-year-old boy. But the power is there, lifted up by that soulful style that David seems to have been born with. The falsetto is choir boy perfect. And yet, no choir boy outside of a southern Baptist church puts the runs in a song like that! And it’s great how the younger kids crowd around him. It seems like David was a magnet, and perhaps it felt good to be in his aura even then. David on Good Thing Utah – Age thirteen, unknown date. “Mini Motown Monster” – this version is butter smooth compared to the one in Wellington. But the power isn’t there as much as before and it makes one wonder if this is around the time that David had his vocal cord paralysis. He seems to be saving his voice, as well he should. And even with that, a beautiful performance. What can be said about this performance that hasn’t been said already? David made this song his own that night and for anyone who saw it, it can never be sung by anyone else and come close to David’s version. Ever. Home at Murray High School. He nailed all the runs, all the high notes – his voice was perfection that day. Charged with the emotion we all witnessed as David was welcomed home, he gave that song everything he had. What is so striking about this version is that David changed it up, adding different runs and phrasing than he did in the first AI performance. Only a few weeks apart and he made the whole song sound new. Ford Day event in Dearborn, Michigan on September 19, 2008. David sang to the crowd that day, making eye contact, turning to every section of the audience. No sign of any vocal distress, in fact, this might be the performance where his voice is the most powerful. There seems to be a new sense of freedom and intensity in David’s performance, perhaps in response to relief that the AI judging was finally over. Hollywood Tree Lighting ceremony, Dec. 6, 2008. Smooth as silk, gentle and sweet, this performance highlights David’s instinct for the subtle. Slowly building in strength, but never overpowering the song, his voice is perfectly controlled, and yet the emotion shines through as always. This was the first time David sang Imagine in public while playing the piano. He was tentative, as he often is the first few times he plays a new song while singing. But the VOICE was sheer perfection. Watching David’s beautiful hands play over those keys was almost a distraction from hearing him sing….almost, but not quite. Another new version, another set of runs, a perfect contrast between his power notes and his soft, near-whispered ones. This was the performance that let AI know, there was an artist in the house. How many different ways can the same song be sung? Ask David. Every time we hear this it has a few change-ups. It’s almost as though the highs and lows and runs depend entirely on David’s mood, the mood of the audience, and whether there are big fluffy clouds in the sky. Who could tire of listening to this song that now belongs to David? Okay, that didn’t work. Sorry. Here’s the link so you can check it out on your own. Enjoy! Bookaholic: thanks for that video! I remember seeing that now that you’ve posted it. The Soul Man from Utah -- hee hee. PS your posting of the video didn’t work because that posting method only works for youtube. I don’t think you can embed MTV videos here. MARLIE/DLIZ -- The GTU Imagine was when he was just 13yo — I think sometime in June 2003. I have to check my vid vault for the exact date (could be on the 8th). Anw, I just finished uploading another video of his UT homecoming. This is quite long, running for 9.26 minutes, but it shows his full homecoming concert, upclose -- Stand By Me (@ 1:36), IMAGINE (@ 5:17) & Angels (7:27). SIGH! I could listen to David’s voice -- singing, talking, humming, just grooving ala WFM Reno -- the whole day and not get tire of it. Scary huh? Oh, JR, that video brought back so many memories of those last few weeks on AI. I wish we got to see him as often now as then. I miss him, sigh. First of all, I want to say thanks for this post! I remember vividly the first time David performed this on A.I. and I recognized the song as soon it started and yelled “NOOOO!” at the TV set. This is one of my all time favorite songs and I had heard so many people cover it so badly that I just couldn’t stand the idea of some kid trying to cover it. And then, David began to sing. Less than two minutes later, tears were streaming down my face. Finally, FINALLY someone actually covered this song properly. I became an instant fan of David’s from that moment on. I have greatly enjoyed every one of David’s subsequent performances of “Imagine” and will never tire of hearing him sing it. Secondly, and I don’t wish to sound like I’m nitpicking, but I was 11 years old when this song came out. It was after the Beatles broke up (which I thought at the time would ruin my life) and it is strictly a John Lennon song, not a Beatles song. It was as good as anything that John had ever written with the Beatles, but this song was all his -- well, at least until David came along and took new ownership of it. Perhaps ‘ownership’ isn’t the best word here… How about ‘stewardship’? Kurt -- I have a really funny image in my mind of you yelling “No!” at the TV lol! And yes of course you are right about it being a John Lennon song. I don’t take that as nitpicking, but as a gentle correction. I’ve always been a fan of John Lennon,but David has revived Imagine and made it his own.I have to admit that I loved the 4/7/10 one among all of them. Now off topic,me thinking,if David is going to be at the finale next Wed.,maybe and I hope He is going to sing/promote his new single,so keep our fingers crossed. KURT -- yes you are right. Imagine is all Lennon. It is the opening track on his album Imagine, released in 1971. It was also released as a single in the US where it reached #3 on Billboard. Am a huge Beatles fan also but crazy over Lennon 🙂 I was also aghast when I 1st learned DA would tackle Imagine, remembering all his runs & melisma in Star Search but so glad to be proven wrong with my misgivings. Imagine…hearing David sing it on AI was the first time I ever shed a tear hearing someone sing. I never really could understand how a song moved someone to tears, even with the many genres that I really enjoy. I found out that night let me tell you! It was probably why David did not care discussing strategies during AI. Dean said that every time strategies were discussed, David would simply leave the room. He didn’t need strategies. With the feedback that he got with Imagine, perhaps he felt he had begun to accomplish what he came to do in Idol. For David, it has always been more than winning. It was sharing the joy within, as he said once said as a child during his Star Search days. Then as a young man on Finale night, it was facing up to challenges and “leaving a good impression” by giving everything he had inside. And wowza did he! Now as a reluctant celebrity growing into the artist he was meant to be, he widens his reach and deepens the impression that he initially unleashed in Idol. Touching lives a song at a time, David has been blessed with the gift to make the world a little brighter, a little more meaningful no matter how brief. And that he takes this blessing as a responsibility rather than a privilege is what endears him to the world, I think. I cried with the news of Lennon’s demise. I grieved that I will never hear another artist that would moved me the way he did. Am glad I was SO wrong. Wow! Great job you Ninjaletas, Marlie and Liz, especially that 13 yo vid, omg, I’ve never seen that!! Somebody’s been digging for buried treasure… and found it! Even tho’ it sounds like the mic is in an underwater tunnel, it’s awesome to see & hear a piece of history being made. What a treat. Thanks for that find, and for keeping the home fires burning too. I always leave here with a big grin on my face! What is that power that David has… that connects us with something beautiful, that overwhelms us with something true, and yes, that makes us cry. JR: that’s too funny -- I didn’t notice the contrast until you mentioned it, but it really is like night and day. highervibe: I hadn’t seen that video, either, until I was looking for “five or six” videos of David singing Imagine. When I saw that pop up on a youtube search, I was amazed that I hadn’t seen it. Although, I think there are hidden gems out there just waiting for us to discover. The other notable feature of the Utah Homecoming is his version of Stand By Me. I think this was a transition version from his SBM AI to his SBM AI Tour. What a difference, right? Am sure we are excited with all the possibilities with David but seriously, anyone here also scared to think of what he is capable of years from now? I mean, just speaking for myself… can my heart take it? GAH. I vowed not to check Emman, Hodges, et al anymore coz they keep on teasing us. But once again, I never learn and clickedon Claude’s latest bubbletweet. Since David’s book has been released earlier in Japan and the Philippines (yup we got 190 copies as of 10AM May 23 Sat), may I request that we don’t post contents, pictures, passages from the inner pages of the book, out of respect for those who would like to enjoy their reading fresh and unencumbered. It is easy to guess that we are all stoked to get inspired once again by David with his memoir. So once you have your hands on a copy, soak it all in but may I suggest that we give ample time for others to enjoy the book on their own. OK, gotta go and visit my dad. Hasta la vista Archies! I understand that a 2nd batch of orders is in the works to arrive end of May. How about you, have you ordered your copy? I did order COS. I called Bookends and told them I was calling from Finland. The lady that answered reacted like I had told her I’m from Jupiter. And it was quite a task to spell my address to her, since I live in a town called Jämsä. Thanks, JR! You came through as expected! I discovered David at Shop Around, then remembered I’d read he had 300,000 hits on his YouTube videos. I visited there for the first time ever and watched David’s 26 videos (currently 76,300). I listened to the Christmas songs, I’ll Be and Angels, and was literally gobsmacked. I just sat there stunned, speechless. When David sang Imagine the next week, that was all she wrote. I was a goner. That night or the next when Imagine was posted on iTunes, I started reading through all the 400-500 comments. They were all interesting and I loved the enthusiasm the posters exhibited coz for the first time in my life, I was a big fan. Then, I hit one particular comment and time stood still. I decided the message was so incredibly profound that David HAD to see it. It was amazing to me that a 17 y/o boy had moved this man so deeply during his time of dire need. I copied it down and mailed it to David in a letter. Later, when I attended the AI concert in Tacoma, I made it up into bookmarks that I gave him with some cookies at the fence prior to the show. It was not long after Linha presented the ‘David is My Hero’ book to him in Utah, and I told him he could use it for a bookmark in the book because I doubt many stories in the book could top that one. I want to thank you, sir. I have saved and lost many soldiers on my hospital beds in the E.R. in Baghdad, Iraq. For the last six months I could not find peace in my heart after I left. I could not find sleep. I could not find reason. I found all of those things tonight as you sang, and I wept so hard. You have an amazing gift. Use it wisely; it will open so many other doors. I will take the risk and dream again. I will imagine. Thank you, David. You brought belief back to a grieving soldier M.D. We say that David is unique, that he has a great gift. We do not exaggerate. We know so from our personal experience and if we didn’t, this comment alone is proof positive. Bookaholic #24 The Iraq soldier story is so moving 🙁 thanks for sharing that. Bookaholic -- Thank you for posting that soldier’ letter. I remember seeing that and it moved me now as in the 1st time i stumbled upon it 2 years ago. And the naysayers say David is just about tweenies & grannies -- hah! Thank you David for the gift that you are. Bookaholic: Thank you for posting that soldier’s words. WOW! How many hundreds of stories of loss and sorrow transformed to something new and hopeful by a young boy’s voice can be told? So many people touched by David. Apparently after Crush, David sang one of the songs “he’s been working on”, but i suspect he asked for no videos of it. Sorry I’ve been a bit disengaged lately with “real life” crashing in around me. Almost lost a friend yesterday who had a severe allergic reaction to food -- thank goodness someone happened to be nearby with an adrenaline shot. Freakish coincidence, and literally saved his life. Marlie, thank you for the awesome write-up of what you rightly say is now “David’s song.” I want to give a go to listening to some of the videos before I comment further on it. In the Beatles version, John Lennon’s voice is raspy, and he cultivates a cool sense of detachment. Most of us had heard this song innumerable times. We knew all the words, but they lay on the surface of our consciousness. When we listened to David’s intimate and emotionally charged version on February 26, 2008, we heard the words for the first time. As David sang the familiar words, we actually experienced Lennon’s idealistic vision. David brings his whole being and emotion into songs he truly connects with -- it truly is a wonder. I would never guessed he would tackle Train. RonaldSF -- good to hear that your friend is ok. You really never know when and from where emergencies will crop up. You also take care. JR #40! I almost spit out my coffee reading the 92% figure!!! Bahahahaha gotta love those fanatical David fans!! oh yeah that’s me too!! Thanks for the great news! sharing something I saw at Snarkies. Thank you Snakies as always! Okay. So the new song leaked. I am really torn about this song. David’s voice seemed tired at that point, so maybe it’s that, but I’m afraid the song doesn’t show off his voice as well as it should. EMBE -- I can understand your tentativeness with the song. I like the tempo but not the melody. I find the song a bit of a lightweight for David, esp if it is being considered his single. My guess is that it is NOT the single. Embe, JR, I’m just not feeling this song. I agree with JR, the tempo is Ok but not the melody. David is struggling on the high notes too. Maybe he is just not comfortable with the song yet. I hope that is it. I worry about his over using his voice and his partially paralyzed vocal chord. Marlie -- we always love anything that comes out of that delicious mouth of him. Wait can I say that? We all know he always needs to woodshed these live performances before they are really ready for prime time, but I actually really, really like the song. It’s a little bit Maroon 5 / Jason Mraz, obviously the stuff David likes, and which his older fans will dig (older fans FTW!). Is it a good showcase for his voice? Hard to tell, actually, especially since contemporary popular music in general is rarely good showcase material for great voices. I love the song. Cool beat, jazzy vibe, catchy. Seems like a hard song to sing. Bring it down a key and David will kill the high notes. Wish we could have seen it better but David seemed to really be into it. I am so there. What I so appreciate with the new offering is the decision to actually let the public hear the song even before he perfected it. Perhaps we are seeing another developing facet in David. A shedding of his self-imposed hardline stance with himself as far as performances is concerned. I once read that the Idols were always aghast, amused and perplexed towards his reactions after he performed in Idol cos he literally agonized over portions he thought he could have done better when to others, they were brilliant performances. (Remember Top 5 when Castro was sitting comfortably in the safe zone and he was next. Castro was laughing at his his dumbfounded face as if saying, “Come on man. AM safe! So why are you surprised you are! Does that mean he is lowering his standards? Nope, of course. I think it is a growing confidence. Getting loose. Getting more relaxed in his skin as a performer. Reaching a healthy level of self acceptance. My only wish in the next album, is more soul. Plus, give us some of that growl please David. I wouldn’t mind being DAID for your growls. 1. his choice for the Idol -- and guys, he actually took a side! 3. his upcoming album/single — and peeps, we have a date! olem -- #31 -- GAH!!!! Thanks for posting that. I love that song, it’s sooooooo fun to hear David sing it. Eeeeeeeee! Boy, that’s some ODD in action, letting the video roll when it’s mostly black. haha But those random flash illuminations here and there sure get the imagination going about David’s own songs and the fun he’ll have singing them…. Oh, and jackryan, thanks for the lyrics (Hey Soul Sister) too, I never could understand all of them, quite. Glad to see someone else squeeing here!! OK, on to other songs and comments…. Re: the song leak. Huh. Well, I like the vibe of it and the energy he delivers it with, and of course he can polish any song to gem quality… but I’m kind of iffy on the lyric. What’s the message? He wishes he could be what the world wants him to be? I’m not loving it, but by the time he’s out performing it for real, I’m sure I’ll have egg all over my face for saying so!!! Remember Crush circa Ford vs Crush after it? But I still hope for another song for the carrier single of his next album. That’s just me. This is OOT. Remember David’s Guatemala trip where he sang CELD in a presscon? PIX from AI -- matching outfits! may mean he is performing during results show/tribute to Simon! He must be incredulous that he actually finished a book about himself! JR: You are a video hound -- thanks so much for this. How cool for David! Marlie -- am on a roll! Done with my presentations and they all went well. Hard to come up with a social marketing campaign and present it to legal minds. Minefield of contradictions haha. Man, the fans’ hunger for him is palpable -- and that’s coming from a haphazard video shoot. I just can’t imagine how you guys will welcome him back when he goes on his book tour and esp his album tour come Fall. I think David will be in a major crying bout again when he sees how much he has been missed by his fans. Am tearing up just thinking about it and am not even gonna be there, GOSH! ok marlie, I was about to go to bed when I found this. But had to scroll up to make doubly sure it hasn’t been posted LOL! I love Showbiz Shelley. David is quite fond of her too. G’nite! OK, here is the YT version of the audio interview. SO wish they video recorded this. I just love Shelly with David. They connect and have a good time, tease each other, and it just makes the whole interview enjoyable. Hi, just tuned in to hear the new song, and I think it’s actually pretty good but you have to hear the studio version to really appreciate the “vibe” from it, to get the vocals mixed in at the right levels with the music. So much of the strength of “Crush” was hearing the background well in addition to the vocals. Sounded from the intro like David worked on it and I love how daring/distinctive it is with the high notes and syncopating. From how he introduced it, it doesn’t sound like it’ll be a single because he wasn’t even sure it would be on the album. As for the lyrics, it sounds like David has a positive outlook, that we have a “destiny” that this “world” intends for us, of becoming better than we often are, and whatever that is involves being with other people. ronald: David confirmed in one of the interviews, above, that this was not going to be the single. PS -- glad to see you popping up out of the workload! JR, I haven’t seen that Guatemala performance of CELD before! Gah! MARLIE #81 -- finally an article that establishes the breadth and width of David’s appeal! Thanks for bringing that over here quickly. JR: Thanks for all the stuff! You rock! I received my COS yesterday. Really enjoying it. Wish I could freeze time & just plow on through but life calls. Today have I recovered enough (so and so) to write a coherent sentence. David just blew my mind up so completely with his hair, smile, outfit, THE WHITE PANTS, his confident, feisty not to mention FLIRTY demeanor and his all-round perfect self, that I’ve been a salivating zombie, sitting in front of my computer trying to comprehend what I have just witnessed. Oh the ear- and eyegasms. I need a cigarette. Anyway, I actually have a huge favour to ask anyone who’s going to a book-signing. If it is at all possible, and if it’s allowed at whatever venue you are going to, could someone give David a letter from me? I’d send it to you (or email it and you can print it if you don’t want to give me your address) ASAP. Please let me know. You can answer me here on TDC or by email, embe86’at’gmail.com. Thank you for even reading this. This is the paragraph that does it for me! Hi ggdoorsfan -- I see that David is a bit ahead of Adam in that poll. Am sure the Glamberts will rally esp owing to their failure to land Adam the Billboard poll. Well we definitely can’t get sick of TheArchulator — ODD notwithstanding. Oh EMBEEEEE, you have recovered, eh… enough for this? P90x definitely working -- traces of abs? I also spliced the huge video of PopDotCom just to focus on David leaving the AfterIdolFinale Party. He won a Hybrid, not a Prius from Idol, right? This is so cute and adorable. A 4-year old singing along to Crush at the Apple Bash. It will put a big smile on your face! Somebody in that little boys house plays “Crush” often enough that he knows all the words! LOL That was adorable -- thanks, Vermeer! Anyone here from Fullerton, CA? I received a text from a friend, passing through CA. It appears COS is NOW available at Barnes & Noble. JR: Oh what I would do to get to curl in bed with him— IT, IT, the book. Yes. That’s what I meant. I have been trying to upload another interview which is uber interesting — where he already announced that his 4th album will be a spanish one! Am preparing to be DAID and GONE by then. But not before helping out in any way to promote it. Now THAT will be HUGE and will expand his reach. Let’s hope my connection doesn’t get cut-off, again, hmmmp. BTW, this vid is part of a playlist I assembled re David’s appearances & red carpet interviews on Seasons 8 and 9 -- http://www.youtube.com/view_play_list?p=924076CFD44EE4DF, for anyone interested. 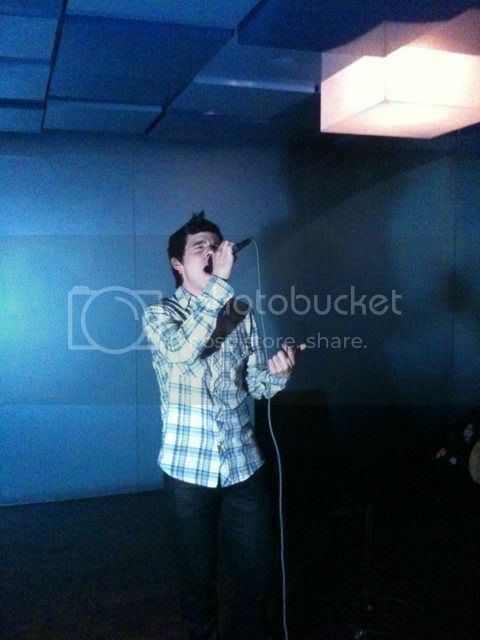 David Archuleta is a dreamer. I find that the thematic flow of the song is big on contrasts – agony-ecstasy; broken wings-fly; MTV-reality; nothing-everything; trying not be vain-but may end up as one someday (hence I decided on interpreting the last line in the 1st verse as “pardon me” instead of “part of me”). The other is the play of words – again a huge interpretation from me – re the use “tried” vs “tired” in the bridge part. So again, if we am hearing & interpreting it correctly, IICOB is a neat piece of songwriting. That’s why am liking it now. I now understand why he likes this song. Am also inclined to believe he helped pen this song. Am warming up fast to this song and in a huge way. Especially if he develops the vocal memory for this and eventually nails it -- like every other song he has commanded. This has potential. OK, am changing my verdict on this one. Really liking it now. Not yet sure as his next single though. JR: I’ve been away all day and now come back to all these videos, interviews, shots of the dailies. Thank you so much for all your hard work!!!!! LOL -- me thinks the DJ got a painful lesson or two from the archies! We thought you’d like to know that we shipped your items, and that this completes your order. Ah, but now we live in an accelerated era, an age when a callow youth can find himself rocketed to national celebrity through the auspices of a popular TV talent show—and then go on to write a pretty damned good book about it! I wonder if anyone ever suggested an audio book of COS… I mean we gobble up the chance to hear him communicate -- whether by singing,talking,rambling or even gesticulating with his hands and arms? What better way to while a cozy evening or a fun-filled warm afternoon than to listen to him narrate about his life? !